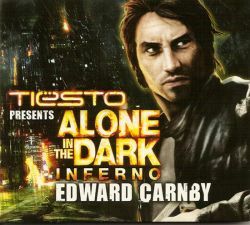 Disc includes "Edward Carnby Tiësto Music Video"
Written and composed by Olivier Deriviere and Tiësto. Remix and additional production by Tiësto for www.tiesto.com. Contains a sample from the recording "Edward Carnby" by Olivier Deriviere & The Mystery Of Bulgarian Voices, licensed courtesy of Atari Europe S.A.S., France. Published by Atari Interactive Inc./Allure Muzik. Extra : Music video editing by Courage, Belgium. Video directed by Nicolas Vantomme. A&R by Iwan de Kuijper for Streamline Sound, www.streamline-sound.com. Design by Hugo de Graafe. Original artwork by Atari Europe S.A.S., France. All tracks © 2008 Streamline Records/Black Hole Recordings.